What's that call echoing throughout the land, bouncing off mountains and tumbling through valleys? 'Cold beer, and lots of it!' the armies of the thirsty cry out. 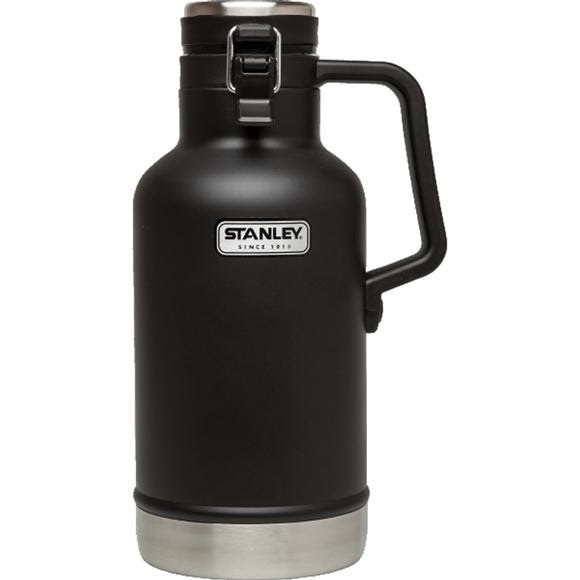 Rising to the call for cold, fresh beer, Stanley's 64 oz Classic Vacuum Growler lets you transport your favorite brew in fully functional and iconic style. Take control with a rugged handle for easy carry and one-handed pouring. What&apos;s that call echoing throughout the land, bouncing off mountains and tumbling through valleys? &apos;Cold beer, and lots of it!&apos; the armies of the thirsty cry out. Rising to the call for cold, fresh beer, Stanley &apos;s 64 oz Classic Vacuum Growler lets you transport your favorite brew in fully functional and iconic style. Take control with a rugged handle for easy carry and one-handed pouring. The wide mouth allows for quick filling, sharing, and cleaning. That satisfying &apos;pop&apos; you hear when you open this bad boy is a sure sign your beer is fresh and bubbly. It ain&apos;t Grandad&apos;s old vacuum bottle, but he&apos;ll raise his pint in admiration. You might just have to top him off. Measurements 6.48" x 4.92" x 11.57"